Thanks to the kindness of Tim Brannan, who saved me from having to pay Lulu's ungodly Canadian shipping costs, I now own a shiny, new, hardcover copy of OSRIC. I'd already seen the final release version of this game in PDF form months ago, but that couldn't compare to the, well, majesty of holding all 380+ pages of it in my hands this afternoon. OSRIC is an extraordinary piece of work -- by far and away the most ambitious of all the retro-clone/simulacrum games published to date. I'm frankly in awe of what Matt Finch and Stuart Marshall accomplished and there's no question I'll get a lot of use out of this book. That said, I'm still a bit disappointed that OSRIC isn't a fully open game like Swords & Wizardry and Labryinth Lord. Had it been released in such a fashion, I suspect that OSRIC might be getting wider use by publishers than it seems to be. I admit I may simply not have noticed evidence to the contrary, but, from where I'm sitting, it seems as if S&W and LL are garnering more attention and support, both by gamers and third party publishers. That the 1e conversions of Goodman's Dungeon Crawl Classics aren't using OSRIC disappoints me. Heck, even Expeditious Retreat Press's Malevolent and Benign, which is explicitly sold as "a first edition bestiary," isn't an OSRIC product, which strikes me as very odd. I'm sure there are reasons why OSRIC, the original retro-clone, now seems (to me anyway) to have been overshadowed by its younger siblings, but it's sad nonetheless. I was, for most of my gaming existence, a staunch 1e aficionado and I still retain much love for AD&D, even if my own tastes have moved closer to OD&D in recent years. Consequently, I want to see OSRIC prosper. Even if it's not likely to be my go-to game for old school fun these days, I think it's important that the standard bearer for the Gygaxian patrimony of the hobby be successful and widely used by gamers and publishers alike, which is why I hope my perceptions are mistaken. Regardless, the print version of the game is simply awesome. Many hearty congratulations to everyone involved in its release and much thanks from me for making the kind of contribution to the old school renaissance I can only dream of doing. I envy you. I would love to get the hardcover, but getting it from Lulu over here in Japan would involve ridiculous shipping costs. Of the three retro-clones you mentioned, only Labyrinth Lord was reasonable to obtain (I just ordered it from Amazon Japan and that was that). Which brings me to your question. I can see why LL is now getting more support (it's the easiest to get your mitts on). But that isn't the case with S&W (another game I'd love to physically own), so I think you are probably on to something with your assessment. That the 1e conversions of Goodman's Dungeon Crawl Classics aren't using OSRIC disappoints me. Heck, even Expeditious Retreat Press's Malevolent and Benign, which is explicitly sold as "a first edition bestiary," isn't an OSRIC product, which strikes me as very odd. I'm beginning to wonder if there was anything needed to produce 1e material. With Goodman, XRP and now Black Blade all making 1e material without it signs seem to point to no. If this is true then OSRIC's legacy may be getting games like S&W and LL started. Clearly something is at work here that we do not understand. I would like to know if the community missed something that we should have seen. There wasn't anything needed to do 1e supplementary material. The issue is the availability of the 1e rules for that material. I think the guys who did OSRIC had a heck of a lot of foresight. Who would have thought that WotC was going to pull down the cheap and legal 1e .pdf's? I agree with Chris: WotC's actions have dramatically increased the usefulness/relevance of OSRIC. I'm not sure what James means about it not being open, though. What's the problem with it being the way it is? I'm thinking the ease of finding 1st edition books (I usually find a player's handbook every other week at my local goodwill) makes it less necessary to use the retro-clone. This seems to be due to the number produced and the high quality bindings used on most print runs. The entirety of OSRIC is not OGC under the OGL. Three large chapters are designed as Product Identity. While that's still fairly generous by many measures, it's a fair bit less than either S&W or LL have done. @James, is the interior artwork better than the cover? My sensibilities reflect that of Eli Elder's statement as regards the lack of support. I'll admit I'm not all that fond of the cover, but the interior art is very nice -- in some cases quite extraordinary. I agree, as I think many of the people behind OSRIC would, that most AD&Ders are quite content simply to use their old books. OSRIC isn't really for them so much as for publishers looking to support 1e legally, thus making my own interests in a more broadly open game less of a concern. That's a fair point, but, one day, those AD&D books will be less readily available and it's when that happens that something like OSRIC needs to move beyond being a "publisher's resource" to being a game in its own right. I've got to say, as someone who owns all of the retro-clones (I think!) in hard-copy, the reason I don't actually use any of them is because I still have my original 1E books. I simply don't *need* the clones, since I have the original. And I must say my local FLGS has a stack of them for very reasonable prices, and they regularly show up at the local used book store as well. So why do I buy the clones? Partly, as a show of support for the OSR. The folks behind them have put in a lot of work, and I do feel a certain level of "helping out the family". I'm something of a collector when it comes to such things, and I likes my collections complete. Too, each of them has their own unique take on the elder games, and it's interesting to see how that is expressed in the rules, even if I don't end up using them in my own game. As far as why the companies haven't gotten on the OSRIC bandwagon when it comes to releasing 1E-related material, it might be as simple as "we don't need to". A simple statement of compatibility isn't a violation of trademark or copyright, and if they're vague (and clever) enough in regards to mechanics, they probably don't need to avail themselves of the license. I hadn't picked up on the fact that the whole book isn't OGC. Maybe that has something to do with it, too. I am glad you got it. I enjoyed the book, but was up by you and figured you would enjoy it more. It is odd that it is not 100% open. Especially since the idea seems to be to use it to produce AD&D 1st ed like compatible products. James, you may recall I fought this OGC battle a year ago, which is the only reason some of OSRIC is currently OGC. It got a little messy. I'm grateful that some of it is OGC, but IMHO the rest should be if for no other reason than ethics. I'm curious, what's in the non-OGL chapters? Is it material that's critical to the game? All the magic items and monsters, among other things, but those two areas especially should IMHO be OGC. Incidentally I wrote all the potions, scrolls, rods, staves, and wands (and a few monsters), so if anyone wants/needs to use those I'm planning to put them out as OGC independently. Just drop me a line. 1. Is there anything preventing a publisher from using OSRIC and explicitly indicating compatibility with 1e AD&D? 2. Even if one owns the original AD&D books, some of the rules are more clearly explained in OSRIC (viz. initiative). 3. It's a pity that the Pete Mullen picture (on page xiv) wasn't used for the cover! Akrasia, as for #1, yes, because 1) The OSRIC license requires that the OGL is used in order to use the OSRIC license and 2) If you use the OGL, the OGL forbids indicating compatibility with a trademark or product identity (as defined in the OGL) without explicit permission. The OSRIC™ Open License is a major deterrent to using OSRIC in serious publishing. Section 5 in particular is a mess. I would have thought the book would be on the 'want' list of most 1e players/gms because as well as combining the PHB, DMG and MM into one handy volume, the book is so much better organised and easier to reference with a comprehensive index, table of contents and lists of monsters, treasure and spells. For the exact same reasons I would also think this is the book DMs should give new players of AD&D. As for the cover art...it's not my favourite piece. But there is a lot of great art inside...including some by the awesome Peter Mullen. In fact, they should have put the Mullen back cover art on the front because it is one of the most evocative pictures of dungeon exploration I've seen! Right, I see. As it stands, it is legally harder to claim to be OSRIC compatible than AD&D compatible. Identifying a product as "OSRIC compatible" supposedly binds the publisher to complying with the WotC OGL which includes the dreaded section 7 of that license which, IMO, is a legal minefield. It also restricts what 1e monsters one can use, of course. If you want to do 1e material, it seems to me that you'd be better off not mentioning OSRIC or the OGL anywhere. 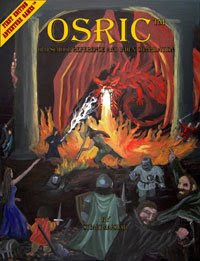 Correct me if I'm wrong, but wasn't Basic Fantasy RPG made before OSRIC? As you know, I fully agree with you on this score. Incidentally I wrote all the potions, scrolls, rods, staves, and wands (and a few monsters), so if anyone wants/needs to use those I'm planning to put them out as OGC independently. Just drop me a line. That's awesome. Thanks for doing that. When you compare it to the S&W Compatibility License, for example, it's definitely not a positive thing. And I think that's a terrible shame, because there really does need to be an AD&D clone out there and OSRIC is simply glorious. I can only assume that the state of the OSRIC OGC and Open License have something to do with the vague rumors I'd heard of WotC's legal department sniffing around the project, but that's just a gut feeling based on nothing substantial, so I may be completely off base here. I believe it was, but, by most current understandings of the term, Basic Fantasy isn't considered a retro-clone but more its own thing. Heck, even Expeditious Retreat Press's Malevolent and Benign, which is explicitly sold as "a first edition bestiary," isn't an OSRIC product, which strikes me as very odd. Malevolent and Benign isn't listed as an OSRIC product because we're testing to see if a lack of OSRIC branding for a 1e product affects sales. So, it's nothing more than a market information gathering choice and isn't representative of any type of switch of support of OSRIC. Our Advanced Adventures line will continue to be OSRIC-branded. In fact, we've got 3 more in the pipeline right now. I still haven't gotten around to getting my copy. The PDF version is nice, but you're right; there's nothing like holding a print version. I will say I had a lot of fun doing some of the artwork in there. It's very vogue, I think, to talk about OD&D on the blogs and forums right now and that's fine. But, AD&D is the game many of us PLAY. I think OSRIC is playing an important role in preserving AD&D. I also wanted to give a shout out to the OSRIC cover. To me, it captures a great AD&D feel. Just to say I've had a great time playing OSRIC in a couple of online games. It has lovely clear presentation and a great interpretation of the AD&D rules. I prefer to run Labyrinth Lord (starting at 3rd level & max hp) but OSRIC's more powerful PCs make it more suitable for starting a game at 1st level - eg in an OSRIC/1e game with PCs starting at max hp, my 1st level Ranger has 18 hp; STR 18/5X and x2 weapon specialised with twin hand axes he's git something like THAC0 15 and 2.5 attacks per round for 1d6+6 damage each. A 1st level STR 18 LL Fighter would have THAC0 16 and 1 attack for 1d8+3 with a sword. Plus STR 18 is unlikely in LL.